Blue Hydrangea and Pomegranates are a beautiful combination of contrast on the "parchment" background. The illumination surrounding the Orthodox text is written in blue in the circular shape symbolizing Eternity. The two white Doves represent Peace, with the names of the Bride and Groom below. 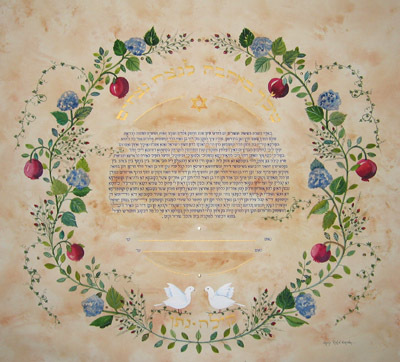 The quote above the text in Hebrew letters "Yours with Love for ever and ever".